HRH The Princess Royal has today (Wednesday 24th October) unveiled Tenovus Cancer Care’s new £1m Mobile Support Unit, the largest mobile chemotherapy treatment unit in the world. 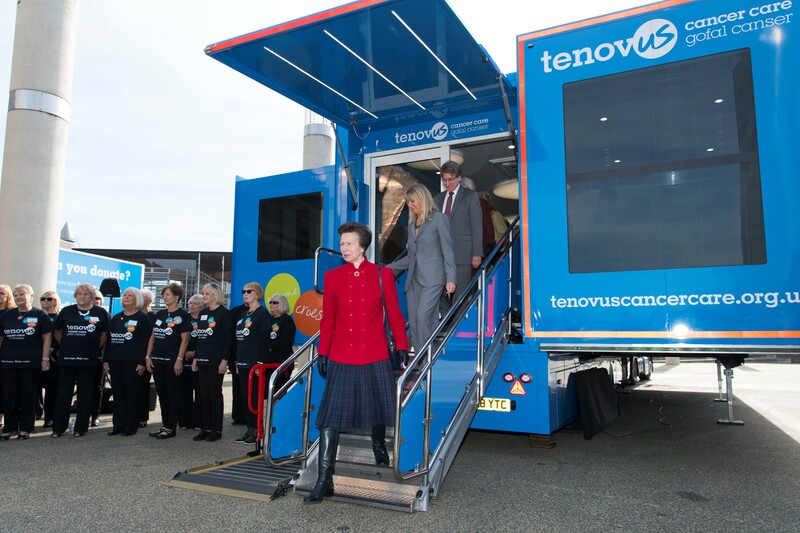 At a ceremony at Roald Dahl Plass in Cardiff Bay, HRH The Princess Royal, a Tenovus Cancer Care Patron for more than a decade, officially launched the charity’s third Mobile Support Unit. It is 60% bigger than Tenovus Cancer Care’s first Mobile Support Unit, launched in 2009, with seven chemotherapy chairs and is capable of seeing 30 patients a day and delivering more than 8,500 treatments a year. Calculations show Tenovus Cancer Care’s two existing Mobile Support Units save the NHS in Wales more than £1m a year and the new Mobile Support Unit could deliver more than 125,000 treatments over the course its lifetime. More than £1m was raised for the build and running costs of the new unit by the Closer to Home Appeal Committee and thanks to generous donations from Principal Funder breast cancer charity Walk the Walk and the Welsh Government, Fairwood Trust, The Simon Gibson Charitable Trust and Carten100. The Closer to Home Appeal Committee was led by Brian Lakin, Chairman and CEO of Sigma 3 Kitchens and supported by Appeal Patron Sam Warburton.